The Christian church on earth is always, in a sense, in exile. Whatever the incidental identities of her members may be—whether of nationality, race, class, or gender—their ultimate identity is that they are in Christ and belong to him. Compared to the ephemeral categories that human cultures have created for distinguishing one from another, this foundation in Christ is absolute and final. As a result, the church never belongs to this world, but always looks to another. Conservative American Christians seem to feel culturally adrift and morally isolated today in ways they have never before experienced. 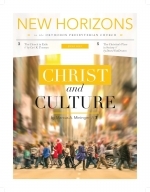 While each generation needs to be careful about exaggerating the magnitude of its own challenges, certain moral sentiments have shifted markedly in a short period of time, in ways that raise difficult questions for Christians seeking to understand their place in civil society and their responsibilities within it. How does being a Christian relate to everyday life? In particular, what value do ordinary activities in this creation, like baking or plumbing or architecture, have for God’s larger kingdom purposes to redeem a people and usher in the new heavens and earth? On one side, some in church history have looked at human culture negatively, as something that is worldly and corrupting and therefore to be avoided. On the opposite side, others have viewed this world’s cultural activities redemptively, as helping bring in and constitute God’s final kingdom rule on earth even now. In between these opposites, a spectrum of other views exists.